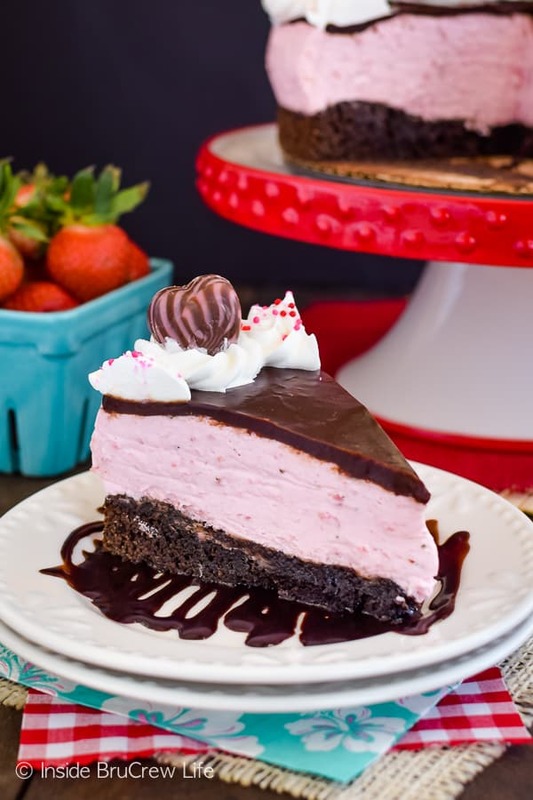 Layers of homemade brownie and fluffy no bake strawberry cheesecake makes this Strawberry Mousse Brownie Cake an impressive and delicious dessert. *Are you enjoying these recipes? Be sure to sign up for the BruCrew email to get these recipes delivered to your inbox. Is everyone else over the smoothies and hummus and Roasted Veggies yet? I would say I am, but we really do eat fairly healthy most days, so those healthy foods will stick around. We balance it out with the crazy baking that I do daily. And by daily, I really do mean daily. You would not believe the amount of crazy baking ideas I have swirling in my head!! With that many ideas, I’m usually in the kitchen each day! Sometimes those ideas go on lists, sometimes they keep swirling in my head until I either forget about them, OR sometimes those ideas have to be made instantly! This brownie cake was one of those crazy hair-brained sweets that came to me one day, and it just had to happen. It didn’t matter that I had no rhyme or reason for it. It had to be made immediately! 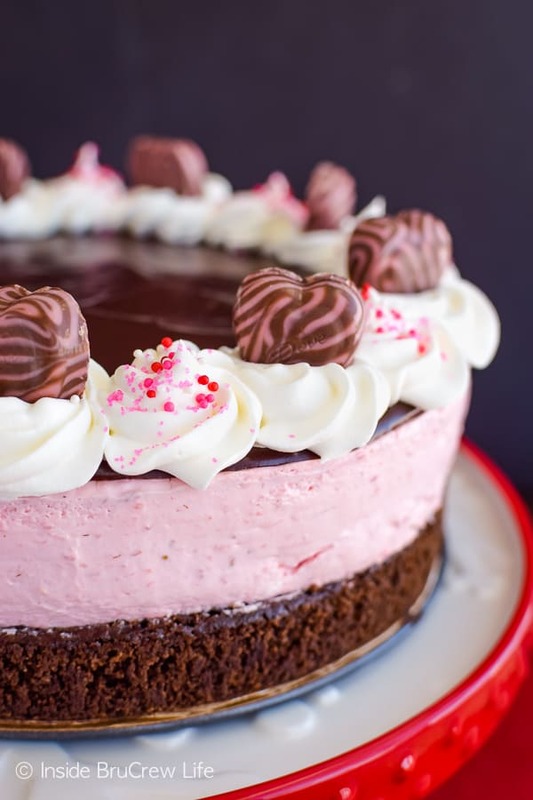 Kind of like this Chocolate Cheesecake Cake…no reason, but holy cow! So worth it!! 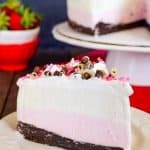 I loved the filling in this Strawberry Mousse Cake, so I decided I needed another fun layer cake in my life, but this time I wanted to use fresh strawberries. Now if you want to use a box brownie mix, you totally can go for it. Most days I’m right there with you jazzing up a box mix! But today I used these Homemade Chocolate Chip Brownies as my base. It’s seriously my favorite brownie to make when I go homemade. Those brownies really have become a tried and true recipe in our house. My littlest guy absolutely loves his plain brownies. Too bad he lives with me and my crazy wacky dessert brain that gets all twitchy when I can’t jazz the brownies up! Don’t worry though. He gets his plain brownies quite often because I do puffy heart love my kiddos! And I usually compensate by making on overly decadent and crazy chocolate dessert the next day! It’s totally a win win for both of us! Make a batch of homemade brownie batter and spread it into the bottom of an 8-inch springform pan. You can line the bottom with parchment paper or 8-inch cake circles. 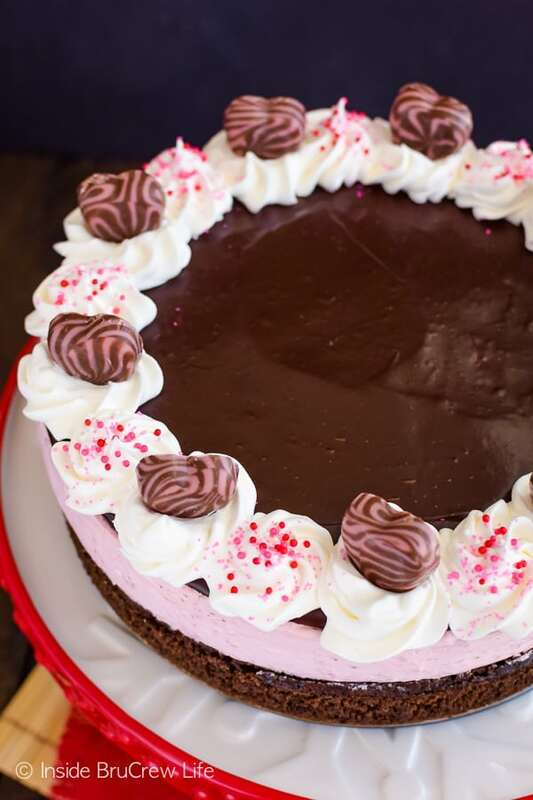 I like using the cardboard circles because it is easy to slide the cake right onto my cake stand or plate. Bake the brownies for about 32-35 minutes, then remove and cool for about 10 minutes. Run a knife around the edge of the pan to loosen it from the pan. Then open the bottom of the springform pan and close it up again. You are not removing the pan. This is just to make sure the brownie is completely away from the edge. Let it cool completely. Let’s make a delicious no bake strawberry mousse. Seriously, you are just a few ingredients away from strawberry goodness. 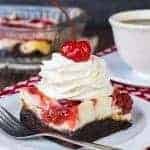 All you need is some cream cheese, Cool Whip, chopped fresh strawberries, and strawberry Jell-O to make a delicious no bake strawberry cheesecake. Seriously! That’s it! Whip it up good and spread it on your brownie. It will fill the pan all the way to the top! This cake is large and in charge and so worth it!!!! Now this is where your patience comes in! Place the pan in the refrigerator and step away slowly! I realize you want brownies and mousse right now! Believe me, so did I. So did I!!! But the mousse needs time to chill and set up. I suggest making it before you head off to dream land, then it will be ready for face planting in the morning! Pour the heavy cream in a small saucepan and bringing it to a very slight boil. Remove it from the heat and pour in the chocolate chips. Shake the pan slightly to get the chips covered with the cream, then let it sit for a minute. Now stir, stir, stir until the rich chocolatey goodness happens. Do not pour this on your cake!!! Hot ganache and soft mousse are not a match made in heaven! Wait 10 minutes for the ganache to cool down because you do not want it to melt the strawberry mousse! You can stir it a few times during this time. 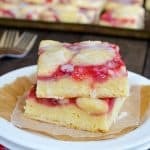 Slowly and gently pour it in the center of the cake and use a spatula to spread it over the top. Let it set one more time before serving. I know, I know! More patience is needed! But then it’s game on!!! Preheat the oven to 350 degrees. Line an 8 inch springform pan with parchment paper or a cardboard circle. Melt the butter. Whisk in the cocoa powder. Let cool slightly. Beat the eggs until frothy and light in color. Add the sugar and vanilla and beat again. Spoon in 1/4 cup of the butter/cocoa mixture and beat again. Add the rest of the butter/cocoa mixture and beat in. Stir together the salt, flour, and baking powder and add to the batter. Do not over mix. Spread in the bottom of the prepared pan. Bake for 30 minutes. Remove from the oven and cool for 10 minutes. Run a knife around the edge of the pan, loosen the pan ring, then close the ring back up without removing the brownie. Let cool completely. Place the diced strawberries in a food processor and pulse until mashed. Stir in the hot water and Jell-O powder until dissolved. Pour the strawberry mixture into the cream cheese and beat again. Fold in 2 cups of Cool Whip gently. Spread over the cooled brownies in the pan. Place in the refrigerator and chill for a few hours before removing the pan ring. Place the heavy cream in a small sauce pan. Bring to a very low boil, then remove from the heat. Stir in the chocolate chips until it is creamy. Let cool for 10 minutes before spreading on the top of the mousse. Let set in the refrigerator again before serving. Top with remaining Cool Whip, chocolate candies, and sprinkles. Store in a covered container in the refrigerator. *This post does contain affiliate links. Inside BruCrew Life does receive a very small percentage from sales made from these links. As always, these do not cost you any extra. Thank you for letting us share products that we love and use. 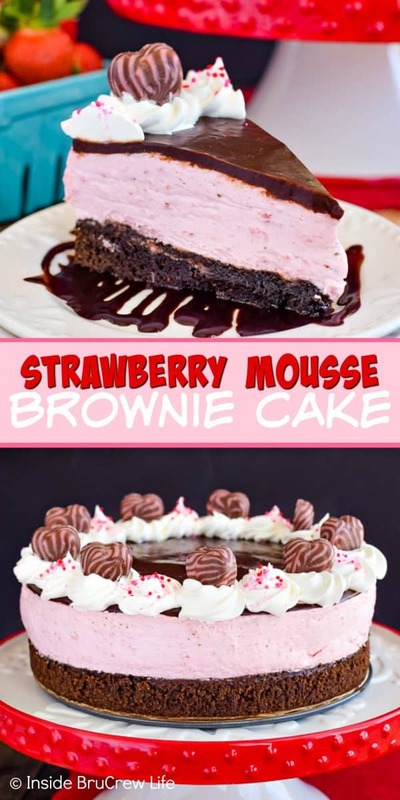 **The recipe and post for this Strawberry Mousse Brownie Cake was first published on January 16, 2015. The photos have been updated and it has been republished on January 22, 2019. This looks amazing, Jocelyn! If someone made me this for Valentine’s, I’d never get over it. In a good way! I totally agree with you…it kind of makes me twitch a little when I make a pan of plain ones 🙂 LOL! I have all those ideas swirlin around my head too. Lots of good ones! So glad you made this one. It’s fabulous! Have a beautiful weekend Jocelyn! Glad I’m not the only one with ideas all the time 🙂 Thank you so much!!! 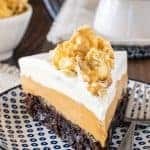 This recipe looks super easy for such a beautiful dessert! 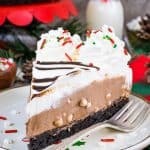 We eat healthy except for all my baking, too, so I totally understand and yes, I’m ready for this dessert! Thank you so much!! It was a fun one to make! I looooove brownies with any kind of strawberry stuff. This looks so delicious! 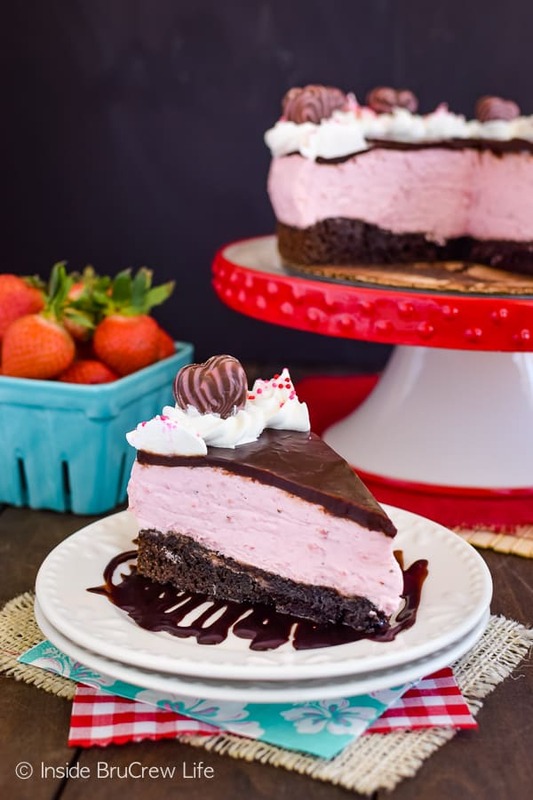 Strawberry and chocolate is just meant to be!!! Thanks girlie!! What a beautiful dessert! Such a perfect combination of layers! I love all of your ideas, Jocelyn! You’re so creative! This is for sure one gorgeous brownie cake. That strawberry mousse looks so light and creamy. Where’s my spoon?! I like smoothies and hummus year round too but there is always a need for treats in our lives! This cake is perfect. I love the combination of strawberries and chocolate! Moderation is totally the key to eating healthy and eating treats!!! I think it helps me stay on track better!! Thank you so much Heather!!! Hahaha I kind of get the twitches when I make plain ones for my kiddos!!! Wow! While I don’t know if I have the patience or not, the end result definitely makes it worth trying! It is totally worth the time it takes to make this. But seriously it really is an easy dessert even though it looks crazy hard!!! This is simply stunning, Jocelyn! This looks delicious! I have ideas swirling around in my head but I never seem to have paper in hand. I could lick the screen right now, thats how good this looks. And homemade brownies. Love!! Ps I am in the kitchen daily baking up a storm. I have to send them to my hubbys work or I’ll eat them all, hehe. Happy weekend! Thank you 🙂 I started a note on my phone to keep the ideas straight since that is always with me. And yes, treats get sent to work with my hubby too!!! I have to try this! It looks wonderful! I have frozen strawberries I put away from last years harvest. If I thaw them they should work just as well shouldn’t they? They should work fine. I would make sure to drain them really well, and you might not need the extra 2 Tablespoons of water. Well this looks like Heaven! Seriously, I’m ready to dive in head first. Pinned! I will never be sick of the smoothies and such but I seriously want like three slices of this cake right now! I pretend like I am tired of them, but really I still enjoy them. But really I enjoy cake and brownies so much more!!! Oh my this is beautiful and sounds so wonderful….wish I had a large piece of it right now….I’d make it this minute if I wasn’t so lazy lol…..
Maybe one day……great job Jocelyn….. This thing is incredible!! Your talent is ridiculous, Jocelyn! Love how decadent and beautiful this is. The strawberry mousse looks so fluffy and light. I feel like that could be a nice summertime dish all on its own! Thank you so much!! You totally just made my day 🙂 And I agree…that mousse could totally be a summer salad dessert! I’d happily put my smoothies away for THIS! Those layers are just gorgeous! I want a slice soooo bad! Scratch that. I want all of its slices! Thank you *thiiiiis* much for the link-love! This brownie cake is awesome! I love everything about this! Beautiful cake! 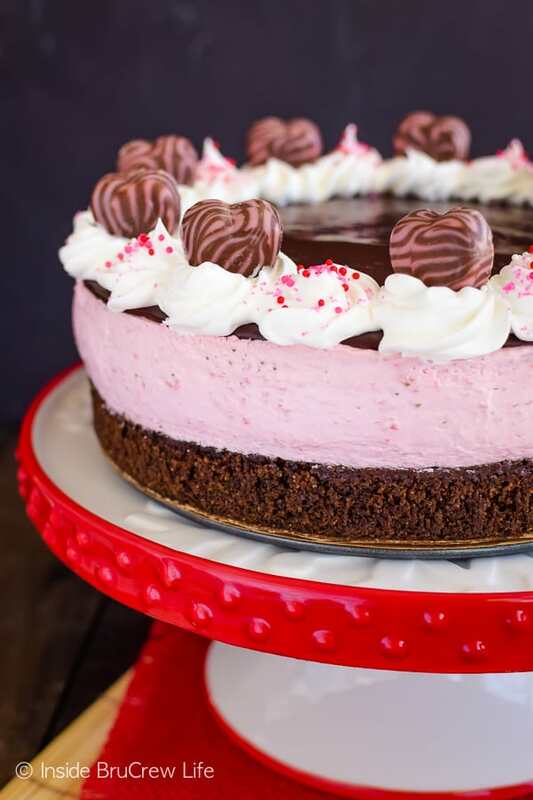 Perfect for Valentine’s Day or whenever a strawberry-chocolate craving hits. 🙂 Sometimes, if you don’t bake the idea in your head, it can keep you up all night begging to be baked. Better to be preemptive and bake your ideas before you lose any sleep. 🙂 Been there. This is completely worth breaking the diet for! Screw the hummus! Have you made this mousse with raspberries? I want to make a raspberry mousse and try something besides just gelatin and whipped cream. this seems a little more special. Jocelyn!!! I just made it with raspberries. I just subbed everything strawberry for the raspberries (raspberry jello) and it’s amazing! I’m going to try freezing some of it and scoop it on some cupcakes instead of frosting. like a fake raspberry ice cream 🙂 I can’t wait for you to see the post! That’s awesome! I can’t wait to check it out! Oh my gosh Jocelyn… That ganache. I want to eat an entire bowl of it with a spoon! And some of those gorgeous homemade brownies on the side wouldn’t be too bad either. 😉 Pinned! Confession…I always eat spoonfuls of ganache whenever I make it 😉 Thanks for sharing!!! What a beautiful cake! I love these layers! This sounds amazing! I wish I had a piece now. 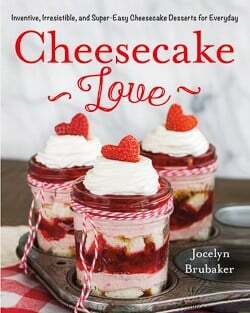 Jocelyn, I just started following you recently and have tried a few of your recipes. Some have been amazing, some haven’t worked out well for me. 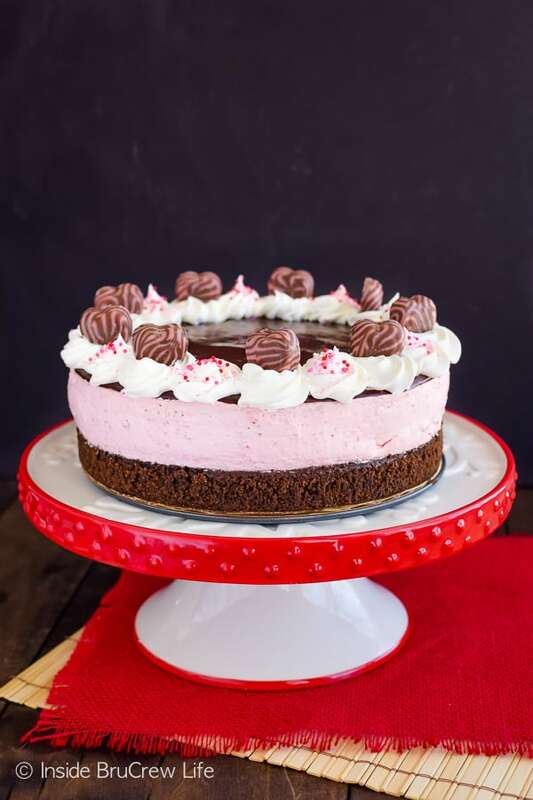 But this strawberry mousse brownie cake is to. Die. For. If I had no other dessert for the rest of my life but this I’d be content. Well worth the effort and the waiting. Thank you for the amazing recipe! Woo hoo! 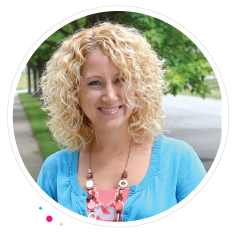 I am so glad to hear that this was a winner for you! My family devoured it in no time at all too! I made this cake on the weekend and it was fantastic! Everyone thought I was amazing. Thanks for making me look good! Wonderful cake, and soooo yummy! I made this for Valentines day it was amazing! I shared on my blog hope thats ok!!! looks delicious! Do you think the mousse would work between layers of a 3 layer cake? I actually do not recommend this mousse for inside cake layers. It is a soft set mousse, and I think the cake layers would squish it out the sides. It looks and sounds wonderful! I am thinking of making this for Easter. How do you think would hold up as individual trifles? Do you think I could make this the night before or is it best the day of? You can make this the day before. The mousse needs time to set up anyway, so that way it will be great the next day. I hope you enjoy it. Just wondering if the strawberry mousse filling is stiff enough that I could use it for a strawberry mousse cake? I’m pushed for time. Could brownie mix be substituted? Yes, just make sure you use a box mix that is for an 8×8 pan. Here is a link to another brownie cake that I did using a box mix. 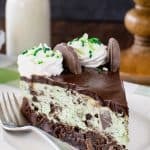 https://insidebrucrewlife.com/2017/01/thin-mint-cheesecake-brownie-cake/ I hope you enjoy the cake!! Thanks. One more question. Could recipe be adapted for 9″ springform pan? I am unable to find an 8″ locally. 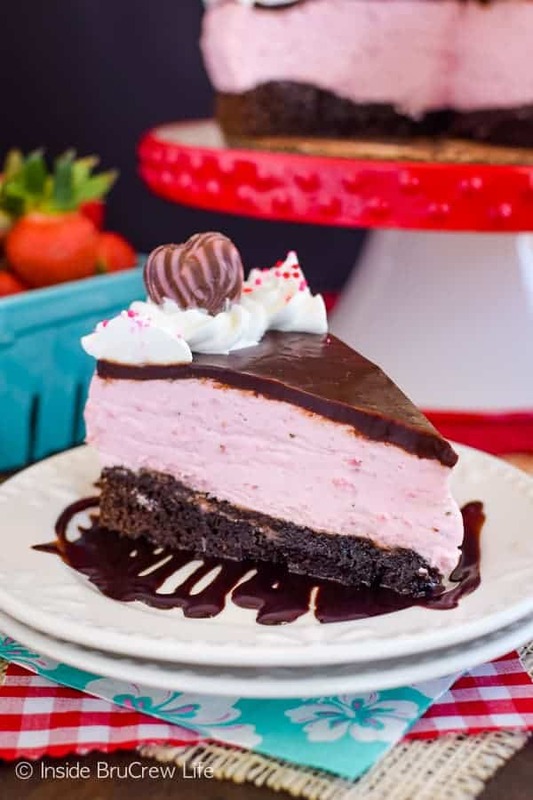 I wanted to make something fun and festive when my kids get home from school on Valentine’s Day and this looks like the perfect recipe to make! Thanks! Swooning over this gorgeous brownie cake! The strawberry mousse is incredible! Perfect treat for Valentine’s Day! This cake couldn’t look any better! It is so pretty & those layers look delicious! The combination of strawberry & chocolate is the best! This looks so rich and decadent! Love the hearts on top!